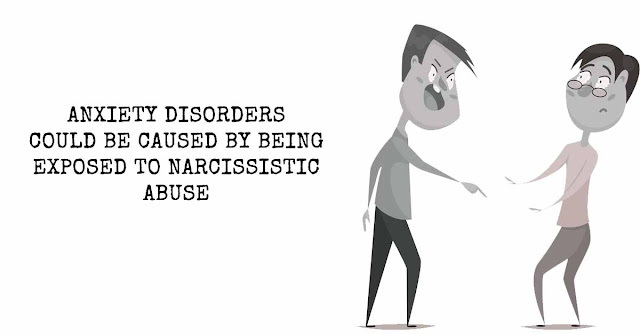 People Who Believe In The Good Nature Of Others, Are Highly Sensitive Or Emotionally Intelligent, Are The Most Common Targets For Narcissistic Abuse. Residing where any kind of emotional or mental abuse takes place is going to affect your health. Not only that, but the way you see yourself, and how much worth you believe you have, will suffer greatly. When you are constantly told that you are the problem, and that your rational and completely normal ways of responding to their abuse is contributing to the issue, what else could possibly be expected to happen? Your mind begins to sever- rationale and fear are intertwined, and the body reacts in several different ways, all displayed through types of anxiety disorders. It’s unhealthy to surround yourself with these types of people, or to stay in a relationship with them. But for some people, the abuse comes from a family member, or parent, and escaping is only an option when you can leave their home. For those individuals, some disorders might have developed as a teenager, and continue to impact their adult relationships today. -Agoraphobia (ag-uh-ruh-FOE-be-uh) is a type of anxiety disorder in which you fear and often avoid places or situations that might cause you to panic and make you feel trapped, helpless or embarrassed. -Anxiety disorder due to a medical condition includes symptoms of intense anxiety or panic that are directly caused by a physical health problem. -Generalized anxiety disorder includes persistent and excessive anxiety and worry about activities or events — even ordinary, routine issues. The worry is out of proportion to the actual circumstance, is difficult to control and affects how you feel physically. It often occurs along with other anxiety disorders or depression. -Panic disorder involves repeated episodes of sudden feelings of intense anxiety and fear or terror that reach a peak within minutes (panic attacks). You may have feelings of impending doom, shortness of breath, chest pain, or a rapid, fluttering or pounding heart (heart palpitations). These panic attacks may lead to worrying about them happening again or avoiding situations in which they’ve occurred. -Selective mutism is a consistent failure of children to speak in certain situations, such as school, even when they can speak in other situations, such as at home with close family members. This can interfere with school, work and social functioning. -Separation anxiety disorder is a childhood disorder characterized by anxiety that’s excessive for the child’s developmental level and related to separation from parents or others who have parental roles. -Social anxiety disorder (social phobia) involves high levels of anxiety, fear and avoidance of social situations due to feelings of embarrassment, self-consciousness and concern about being judged or viewed negatively by others. -Specific phobias are characterized by major anxiety when you’re exposed to a specific object or situation and a desire to avoid it. Phobias provoke panic attacks in some people. -Substance-induced anxiety disorder is characterized by symptoms of intense anxiety or panic that are a direct result of abusing drugs, taking medications, being exposed to a toxic substance or withdrawal from drugs. -Other specified anxiety disorder and unspecified anxiety disorder are terms for anxiety or phobias that don’t meet the exact criteria for any other anxiety disorders but are significant enough to be distressing and disruptive. Those toxic people who willfully abuse others get a kick out of telling their victims that they are somehow socially, emotionally, and intellectually substandard. You’ll notice that whenever these people are caught or confronted about their behavior, they will always resort to playing the victim. In extreme cases, they even try to make it seem as though you are the abuser. People who feel like they have become trapped in the poisonous whirlwind of narcissistic abuse tend to know something is just not right. The irrational and maddening claims the narcissist makes never fully sit well with them. However, unless they are educated about these toxic personalities and abusers, they will continue to find themselves in the endless cycle. Why is that? Because narcissists target those who are prone to behaving like actual human beings; compassionate, empathic, and believe in the good nature of humankind. Anxiety disorders are unpleasant to live with. They can take over your life at a moment’s notice, and they don’t make sense to those who don’t have them. To be honest, they don’t make much sense to those who have them either. That’s why this information is important. It’s Important To Know That If You Suffer From Any Of The Above Mentioned Anxiety Disorders, And Have Been A Victim Of Narcissistic Abuse, You Can Take Your Life Back.